If you haven’t done this already, you absolutely should because it is the best caching plugin out there for WordPress and there is really no good reason to not utilize it. 2. Update the PHP memory limit and APC size of your hosting environment. As of February 2015, GoDaddy defines a 64M (MB) memory limit for PHP and a 32M (MB) APC shm_size (shared memory size). APC stands for Alternative PHP Cache and is an awesome way to improve your environment’s PHP performance. It is used to cache and optimize segments of your PHP code, reducing the tax your application has on the server and freeing it up to handle requests at a much faster rate. This will give you all the PHP information installed and setup in your environment. There is a lot of information here so don’t be alarmed. We will focus on a few specific areas. First, let’s look at the PHP Core settings. Find the section that reads ‘Core’. Then under that table, find what is defined as the ‘memory_limit’. It probably reads 64M for 64 Megabytes. We will come back to this page later to verify our updates have taken place. Now, check to see if APC is enabled — it should be based on the default settings that GoDaddy is providing. Find the section labeled ‘apc’ — it should be near the top of the page because the configuration profiles are displayed in alphabetical order. Find the ‘shm_size’ definition. It should read 32M for 32 Megabytes. The main point of this block is to increase the shm_size to 128 megabytes. It accomplishes some other things as well, but those are a good solid base to go off of. I noticed when I created my php.ini file with just the PHP memory_limit update, it disabled APC for some reason. The lines at the top of the APC configuration make sure it is enabled. Save the file. Now, in order to get your environment to read the php.ini file you just created, we will need to reset PHP. In cPanel, find PHP Processes under Software. Hit the ‘Kill Processes’ button and let it load. Then go back and refresh your phpinfo.php file you created. Go through and make sure that your memory_limit is now 128M and that APC is enabled and shm_size is 128M as well. If you see those updates, then you have successfully updated your PHP and APC memory size! ALERT! Be sure to delete the phpinfo.php file you created. You don’t want that file hanging around and accessible to read as it gives clues to your system and is a security hole. 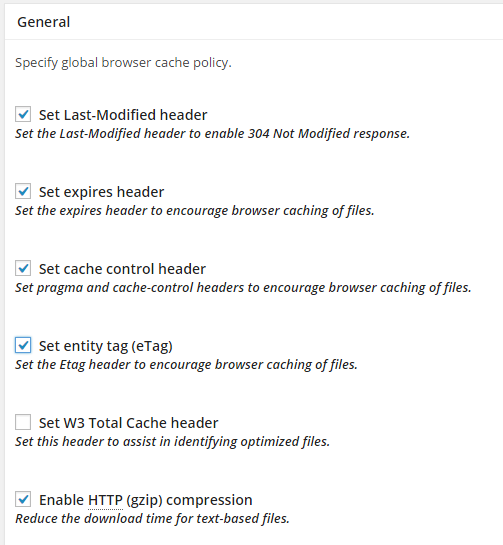 Now that we have the PHP memory and APC upgraded and enabled, we will want to configure W3 Total Cache to utilize APC. Login to your WP admin and go to the Performance settings and the General tab. For all of the sections of caching that you want to use, be sure to select ‘Opcode: Alternative PHP Cache (APC)’ from the dropdown as the method. We recommend utilizing all of the out-of-the-box caching methods (Page, Minify, Database, Object, Browser) with Page, Minify, and Browser caching being the most important. If you want more detailed explanations or instructions on how to get more out of your configurations, contact us today.